ALMATY, Kazakhstan (AP) — The bloodiest massacre of protesters since Tianamen Square turned Uzbekistan into a pariah state. Now, the United States needs its help over Afghanistan — and has launched a flurry of overtures while putting aside concerns over human rights. 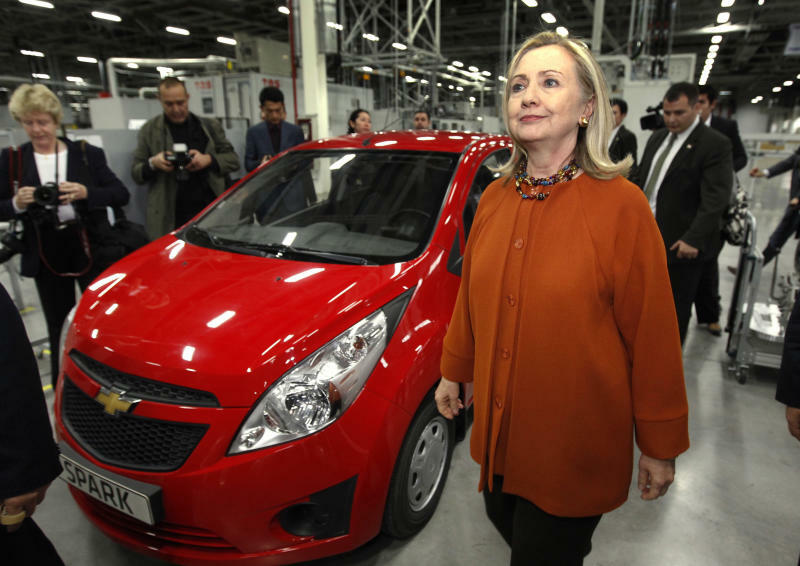 Top U.S. officials, including Secretary of State Hillary Clinton, have paid courtesy calls over the past year, while General Motors and other major U.S. companies look determined to deepen their involvement in the Central Asian nation. Meanwhile, Uzbekistan has withdrawn from a Russian-led military alliance, signaling a downturn in its relations with the former overlords in Moscow. This has fed speculation that the nation, hoping to benefit from the transit of U.S. troops and hardware, could invite the United States to set up a military base on its soil — a development that would infuriate Russia and raise tensions in the volatile region. Uzbekistan has been run with unflinching severity by 74-year-old former Soviet party boss Islam Karimov since before the country gained independence in 1991. After the 9/11 terrorist attacks, Western leaders overcame their scruples in dealing with Karimov's government and the United States secured a lease for the Karshi-Khanabad air base in Uzbekistan. That all ended when government troops indiscriminately gunned down hundreds of protesters in the eastern city of Andijan in 2005. Uzbek authorities expelled U.S. troops from the country in anger over Washington's criticism and accused Western powers of complicity in the Andijan protests, which they said formed part of efforts to foment revolutions across the former Soviet Union. Uzbekistan has also been the subject of persistent allegations of torture of political prisoners and other human rights abuses. With access to the country barred to almost all foreign reporters, verifying claims by some State Department officials that the rights situation has improved marginally is virtually impossible. When NATO convoys through Pakistan began coming under sustained militant attack in 2009, U.S. military planners looked north and saw the makings of a route snaking thousands of kilometers (miles) through Central Asia and perennial strategic foe Russia. Trucks carrying NATO goods are rolling across Pakistan's border into Afghanistan again after the U.S. apologized to Pakistan for the deaths of 24 Pakistani troops last fall. But despite the additional expense, the safety of the northern route makes it a more attractive option. Until now, the traffic through Uzbekistan has mainly gone in the direction of Afghanistan, but the priority in coming years will be shifted to reverse transit along the Northern Distribution Network. The most reliable route starts on a recently completed railroad that crosses the Amu-Darya River, which marks Uzbekistan's 137-kilometer (82-mile) border with Afghanistan, and provides the speediest and simplest transportation northward. In an apparent effort to soothe concerns that the United States will abandon Central Asian as soon as its engagements in Afghanistan are wound down, investments enthusiastically backed by Washington are trickling in. General Motors stepped up its local presence in November by opening a new engine plant. The GM Uzbekistan joint venture, in which the U.S. company controls a 25 percent stake, provides work for around 6,600 people and turns out 200,000 Chevrolet passenger vehicles annually. In June, U.S. engineering giant KBR said it will provide its technology to develop a chemical plant in Uzbekistan that will seek to better exploit the country's substantial natural gas reserves. Still, U.S. officials hope to build on those types of achievements and a large congressional delegation is due soon for another round of diplomatic cordiality aimed at cementing business ties. There are also increasing hints that the U.S. will intensify military ties with Uzbekistan. That development would dismay the advocacy community, which has for years been drawing attention to the country's egregious rights record. The U.S. in January waived a ban on providing military assistance to Uzbekistan, although the State Department insisted it would only be eligible to receive non-lethal equipment, including night vision goggles, uniforms, GPS devices and other defensive equipment. Last week, Uzbekistan announced it had suspended its participation in the Russia-dominated Collective Security Treaty Organization security pact. "Dropping out of the CSTO means that something deemed more desirable by Karimov's regime is available elsewhere. That's highly likely to be material benefits and international respect garnered by being a partner on the drawdown in Afghanistan," said Deirdre Tynan, Central Asia project director for the International Crisis Group. Analysts across the former Soviet space have read the CSTO pullout as a prelude to closer cooperation with the United States. "We will soon hear about how Uzbekistan has entered into a new strategic alliance and granted its territory for U.S. military bases," said Vadim Kozyulin, Central Asia expert at the Moscow-based Russian Center for Policy Studies, in a research note. A U.S. diplomat said on condition of anonymity that the United States has made no request to open a military base in Uzbekistan. Such a base would deeply antagonize Moscow, which has historically tried to assert its say on what foreign military presence is permitted in a region it considers its geopolitical backyard. The United States already has an air base in neighboring Kyrgyzstan that it uses for ferrying troops in and out of Afghanistan and staging airborne refueling mission. It looks possible that Central Asian governments could become recipients of U.S. military hardware as the Pentagon looks to limit the expense of hauling the materiel out of Afghanistan. The U.S diplomat said the process for the transfer of excess defense equipment would require approval from the State Department. Russian daily Kommersant in June cited an unnamed government source in Kyrgyzstan as saying talks on a plan over exchanging military hardware for Afghan access were held during a March visit by Secretary of Defense Leon Panetta. The newspaper suggested similar agreements were in place with other governments, including Uzbekistan's. The centrality of Uzbekistan's role in the Afghan drawdown means they will be in a strong bargaining position for obtaining as much as possible in return, however. "There is a significant, even likely, chance that the Uzbeks get their hands on some lethal stuff that originally was not planned," said Alexander Cooley, political science professor at Columbia University. "If the Uzbeks ask for some specific pieces of equipment and are at first denied, they'll keep trying and bargaining until they get them."